Sundots are a daily sun protection gummy that complements the sun protection regimen you already have in place—sunscreen and protective clothing—by enhancing your skin’s ability to resist damage from UVA and UVB radiation. The active ingredient in the gummies is polypodium leucotomos extract, or PLE, that is sourced from an Ecuadorian fern used for centuries for its skin-enhancing capabilities. 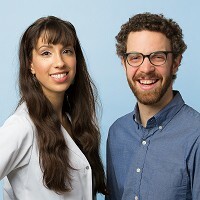 More importantly, it has been the subject of over 30 years of clinical research—which is how Sundots co-founder, Dr. Emilia Javorsky, a dermatology researcher at Harvard Medical School, learned about it. PLE is rich in polyphenols, which act like antioxidants to amplify our skin's ability to prevent damage from UV rays. It works at the cellular level to fill the gaps in protection when other sun protection solutions let us down. Dr. Javorsky and her team decided on a gummy as an easy (and tasty) way to incorporate that extra protection in our daily lives. Sundots are non-GMO, vegan, and made in an FDA-certified facility in the USA. Are Sundots a replacement for sunscreen? No, Sundots only complete your sun protection toolkit. The best sun protection always includes Sundots, sunscreen, and UPF-rated clothing. While sunscreen prevents UV radiation from reaching your skin, Sundots work from the inside out—at the cellular level. Sundots don’t replace sunscreen; they help fill the gaps for year-round, full-body protection when sunscreen and clothing let us down. What is the active ingredient in Sundots? How does the active ingredient work to help prevent and repair skin damage caused by UV rays? Polypodium leucotomos extract is the active ingredient for sun protection in Sundots. This plant derived ingredient native to South America is rich in a certain class of molecules called polyphenols. After 30+ years of research, it has been found that the polyphenols act as potent antioxidants when administered orally that enhance the skin's ability to repair the oxidative damage caused by UV-light. Just as sunscreen prevents the light from getting to the skin, the polypodium leucotomos extract helps to power up your skin to deal with potential sunlight that does get through. The enhanced ability of the skin to deal with UV damage also has many aesthetic skin benefits such as increased skin elasticity and an increase in even skin tone over time. Sundots also feature 100% of your daily recommended value of vitamin D3, a key nutrient linked to bone health, among other benefits. A meta-analysis of the best quality data suggests that about 40% of U.S. adults do not have adequate vitamin D intake. 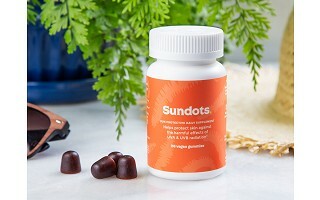 Since it's such an important nutrient, we're excited to include all-natural, vegan vitamin D in every Sundots gummy. How quickly do Sundots start working? Do Sundots have any side effects? The best research on polypodium shows that sun protection benefits emerge in as little as two hours. These benefits can build up over time—that’s why Sundots is focused on a fun, everyday gummy format. The active ingredients in Sundots have been used for decades with no serious adverse effects, and Sundots feature that same great track record. As with all dietary supplements, if you have any medical condition, or are pregnant or nursing, you should consult with a doctor prior to taking Sundots. Are there beauty benefits of Sundots? When will I first notice the beauty benefits of Sundots? Yes. With continued use, Sundots has strong skin beauty benefits, as polypodium can help to repair skin at an accelerated rate. This means skin appears more youthful, even-toned, and with a smoother texture. Users have first noticed more even-toned, less wrinkly, and more radiant skin within 2-3 weeks of daily use. Benefits can continue to grow with sustained use over time. Do Sundots interfere with vitamin D production? No. The activity of polypodium is unrelated to the chemical mechanism of vitamin D production. 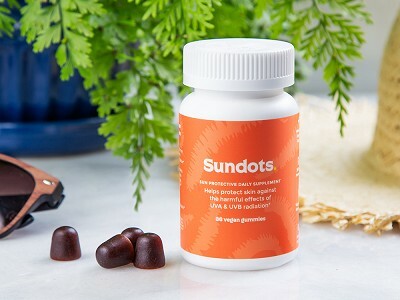 Plus, Sundots include 100% of the recommended daily value of vitamin D, a critical nutrient that studies have shown many people around the world are chronically deficient in. Can I give Sundots to my kids? Over 30 years of study and use of polypodium has established a strong safety profile for this all-natural ingredient. However, there have been no child-specific studies of polypodium. Therefore, out of an abundance of caution, we recommend Sundots for those 12 and up. As with all supplements, if you or your child have any medical condition, consult with a doctor prior to taking Sundots. Sundots are a daily sun protection gummy that complements the sun protection regimen you already have in place—sunscreen and protective clothing—by enhancing your skin’s ability to resist damage from UVA and UVB radiation. The active ingredient in the gummies is polypodium leucotomos extract, or PLE, that is sourced from an Ecuadorian fern used for centuries for its skin-enhancing capabilities. More importantly, it has been the subject of over 30 years of clinical research—which is how Sundots co-founder, Dr. Emilia Javorsky, a dermatology researcher at Harvard Medical School, learned about it. PLE is rich in polyphenols, which act like antioxidants to amplify our skin's ability to prevent damage from UV rays. It works at the cellular level to fill the gaps in protection when other sun protection solutions let us down.